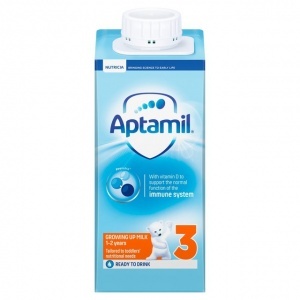 Aptamil Growing Up milk 1-2 years is nutritionally tailored to your toddler's stage of development. Suitable from 1-2yrs, it contains Pronutra+, our unique blend of ingredients. Water,Skimmed Milk,Lactose (from Milk),Galacto-Oligosaccharides (GOS) (from Milk),Vegetable Oils (Rapeseed Oil, Sunflower Oil),Emulsifier (Mono- and Diglycerides of Fatty Acids),Fructo-Oligosaccharides (FOS),Fish Oil,Calcium Citrate,Acidity Regulator (Citric Acid),Vitamin C,Calcium Hydroxide,Calcium Phosphate,Milk Flavouring,Potassium Citrate,Sodium Citrate,Ferrous Lactate,Potassium Hydroxide,Zinc Sulphate,Vitamin E,Vitamin D3,Magnesium Hydrogen Phosphate,Vitamin A,Vitamin B12,Pantothenic Acid,Potassium Iodide,Riboflavin,Nicotinamide,Vitamin K1,Biotin,Vitamin B6,Thiamin,Folic Acid. per 100ml: Energy : 275kJ/65kcal, Fat : 2.6g, of which, saturates : 0.4g, of which, unsaturates : 2.2g, of which, LCPs? : 0.022g, - Arachidonic acid (AA): 0.001g, - Docosahexaenoic acid (DHA): 0.012g, -Eicosapentaenoic acid (EPA): 0.008g, Carbohydrate : 8.6g, of which, sugars : 8.4g, of which, lactose: 8.1g, Fibre : 0.8g, Protein : 1.5g, Salt : 0.07g, Vitamins: LRV*, Vitamin A : 68?g-RE 17%, Vitamin D3: 3.1?g 44%, Vitamin E : 1.1mg ?-TE 22%, Vitamin K1: 5.1?g 43%, Vitamin C : 15mg 33%, Thiamin (B1) : 0.04mg 8%, Riboflavin (B2) : 0.23mg 33%, Niacin (B3): 0.2mg 3%, Pantothenic acid : 0.58mg 19%, Vitamin B6 : 0.06mg 6%, Folic acid : 12?g 10%, Vitamin B12 : 0.4?g 50%, Biotin : 1.3?g 13%, Minerals: LRV*, Sodium : 26g, Potassium : 75mg 8%, Chloride : 44mg 9%, Calcium : 91mg 17%, Phosphorus : 50mg 9%, Magnesium : 5.6mg 7%, Iron : 1.2mg 15%, Zinc : 0.9mg 18%, Fluoride : <0.003mg, Iodine : 20?g 25%, ? Long Chain Polyunsaturated fatty acids : , *% Labelling Reference Values. 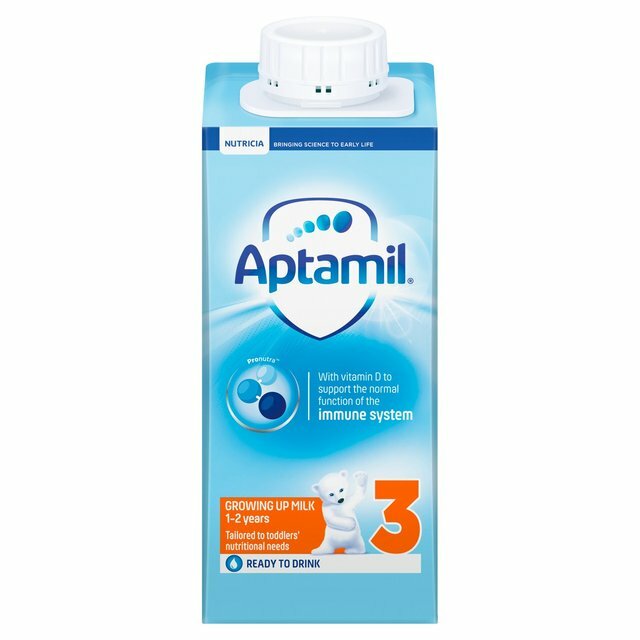 Your toddler will require about 2 x 150ml beakers of Aptamil Growing Up milk a day, as part of a balanced diet. Aptamil Growing Up milk is specially formulated to help meet the increased nutritional needs of toddlers from 1 year onwards. Preparing your toddler's drink 1. Shake the carton of Aptamil Growing Up milk before opening. Do not allow prolonged or frequent contact of drinks with your toddler's teeth as this increases the risk of tooth decay, ask your healthcare professional or dentist for advice.